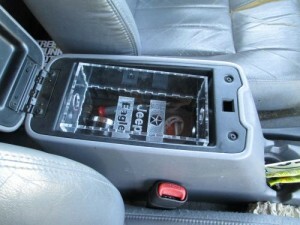 I’ve discovered a fatal flaw in my beloved 1998 Jeep Cherokee – the armrest storage is too deep to be useful. 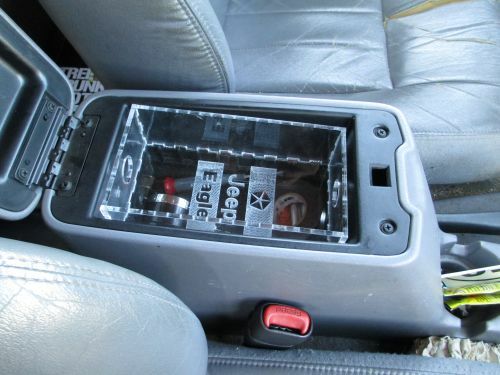 However, there are dividers for cassette tapes in there that provide a nice support for a tray insert, allowing for much more organization. 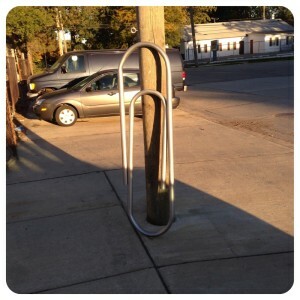 What’s been happening at i3 lately? A bunch of things. But, here are some highlights. 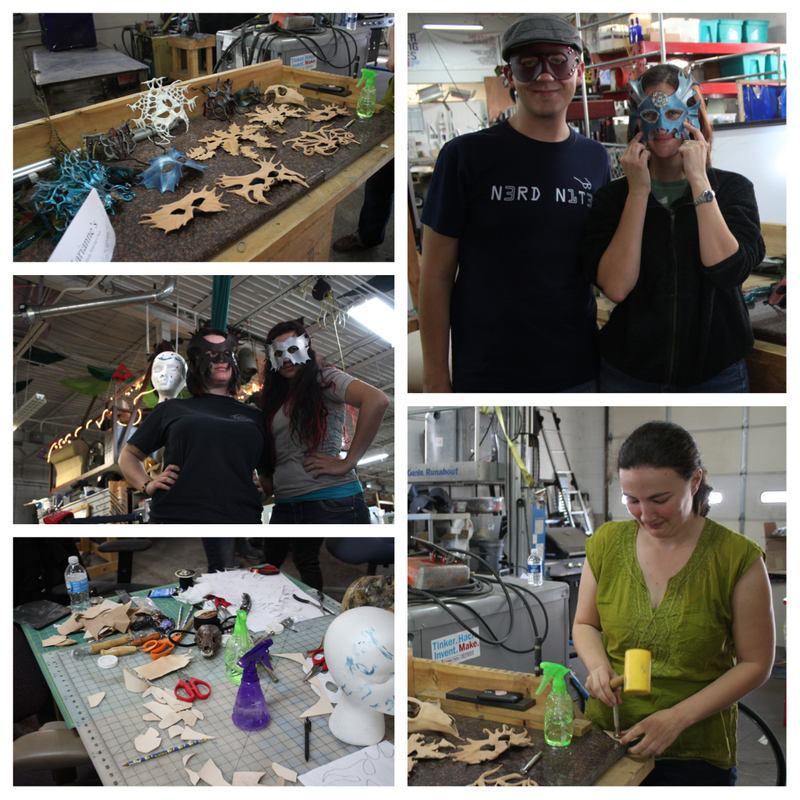 Karriane G. taught a few classes on leather mask making. It was perfect timing right before halloween. Students learned the basics of forming with leather, and were able to follow through creating their own design, adding hardware such as studs and grommets, and finally painting their creation. They’re all set for a masquerade! 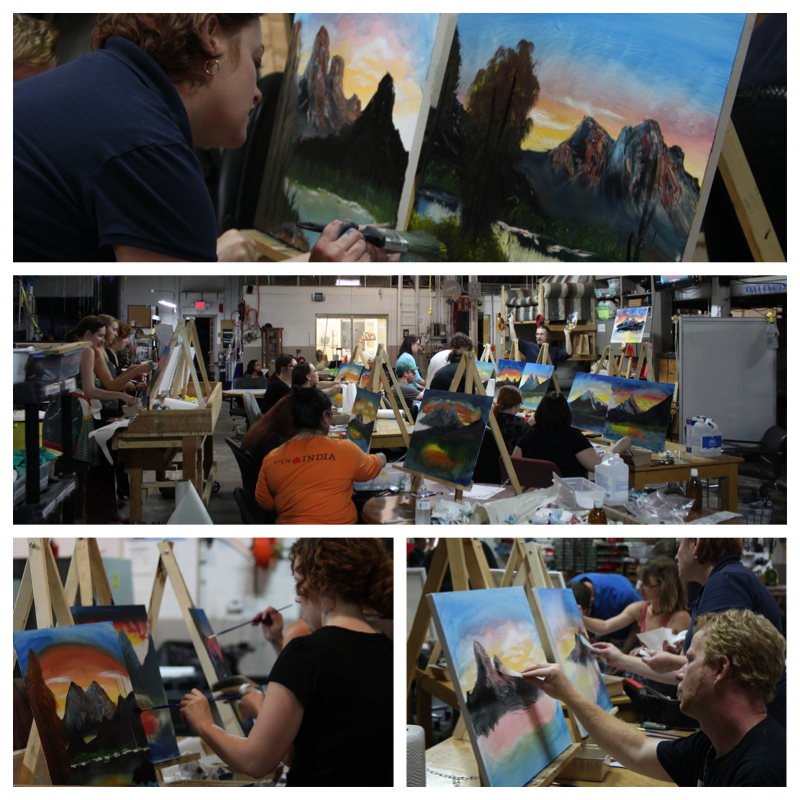 Kevin F. has been busy teaching oil painting classes. These have been insanely popular, often filling up within a day. It’s so amazing to see people come in and learn new techniques. Most of the students came with little-to-none painting experience, but all left with smiles on their faces. 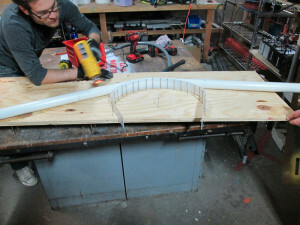 Of course making a giant paperclip out of metal would be insanely heavy, so it’s actually that universal crafting material, the grown-up version of popsicle sticks: Schedule 40 PVC! 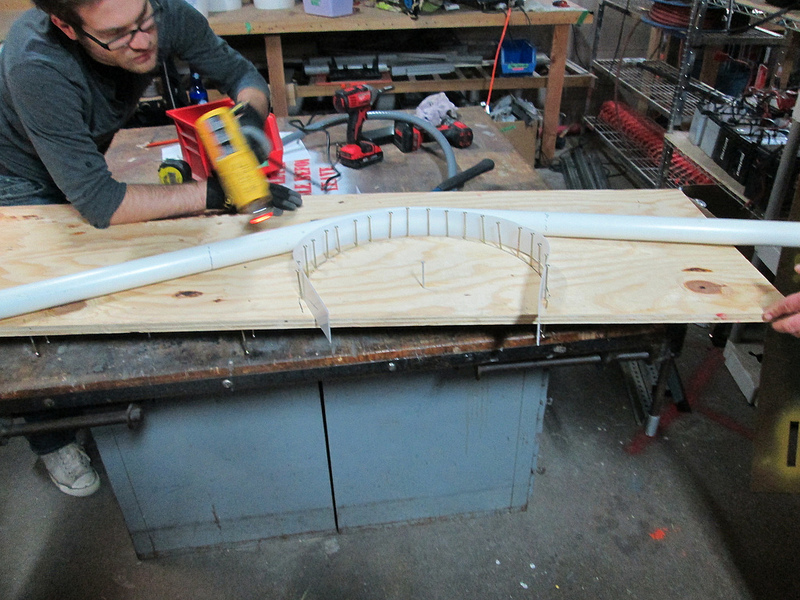 Bent and formed by a combination of hot air, teamwork, carefully placed screws, and minor burns. 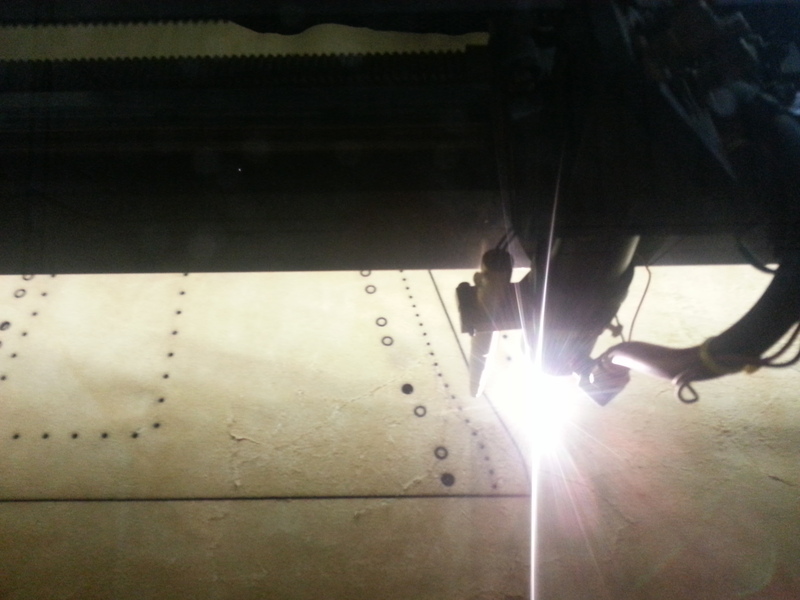 Full Spectrum 40W Laser Cutter Up and Running! 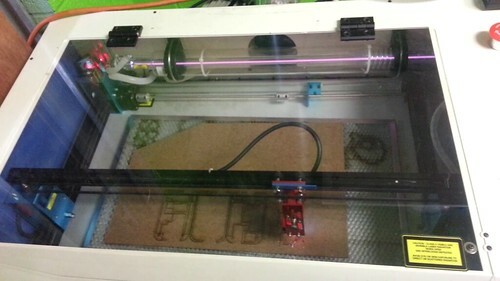 At the Red Bull Creation this year, i3Detroit won a 40W Full Spectrum Generation 5 Hobby Laser with a 16″ x 12″ bed. This prize was awarded to i3Detroit as the Team Choice award prize. 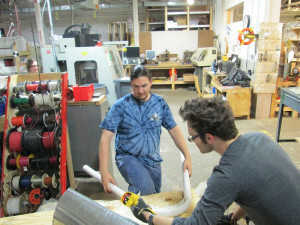 After much design work, purchasing, and duct installation, we now have the machine up and running in the Fab Lab. Wiki page for the machine. We will be having training classes on the machine in the coming weeks, so watch this space and our mailing list for information. https://www.i3detroit.org/wp-content/uploads/2014/03/Logo_large_png8-300x98.png 0 0 agmlego https://www.i3detroit.org/wp-content/uploads/2014/03/Logo_large_png8-300x98.png agmlego2013-09-27 14:09:382013-09-27 14:09:38Full Spectrum 40W Laser Cutter Up and Running! 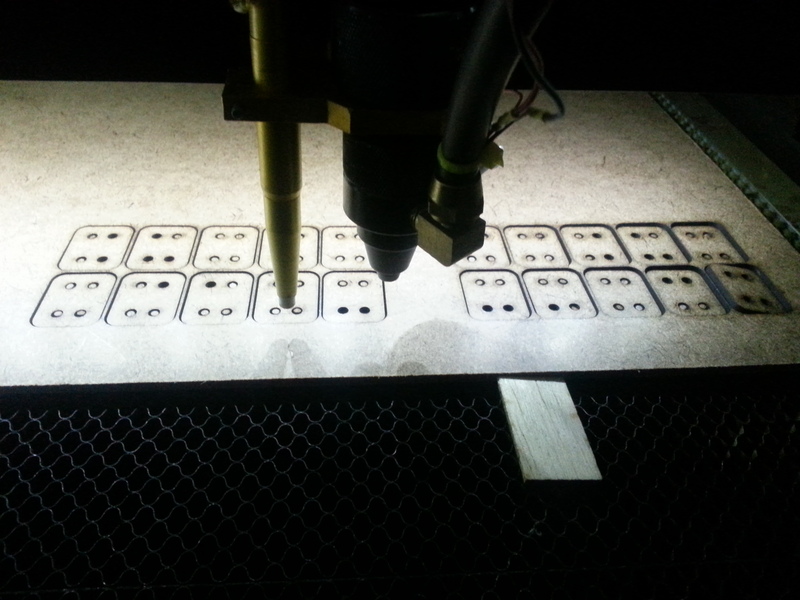 When I was finally cleared to operate the 150W laser cutter affectionately called “Bumblebee”, the first thing I did was to turn in a complete circle, eyeballing everything within walking distance as a potential target for a laser-drilled hole. After making an acrylic coaster and a few boxes, my focus shifted (no pun intended), and I started to think about making things I had a use for… the sorts of things that would not only look good, but would last a long time. 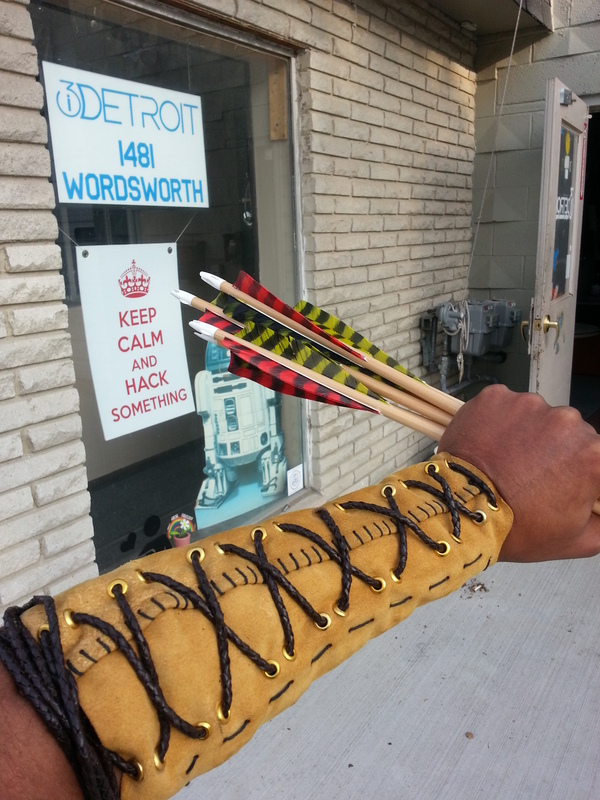 The first project I settled on was an archery bracer, made of buckskin suede. Rather than start with an existing pattern, this was created from scratch in Illustrator. For the 3/16th of an inch thickness of suede, a series of 1.5 mm holes in the pattern was enough allow the pattern parts to be laced together. 3/8″ holes were cut to place grommets in the suede, providing lacing positions. The pattern consisted of an outer wrap, intended to go all the way around the arm, and an inner piece which would sit flush against the forearm. 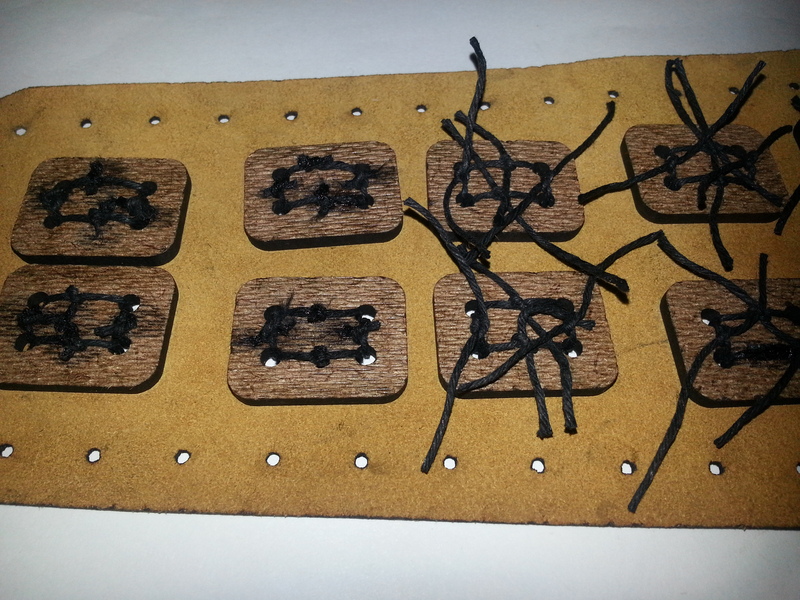 Between them, a series of 10 “plates” of chipboard would provide armoring, absorbing the shock of impact in the event that the bowstring hit the bracer. 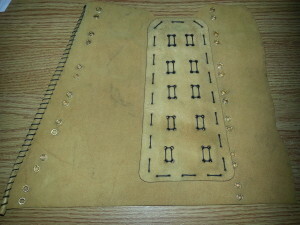 The armor bits were cut first from chipboard, and then the buckskin was placed into the cutter. Soft leather naturally has a wave pattern to it unless its been laid or pressed completely flat, so it’s important to smooth out as many wrinkles as possible prior to starting the cut. 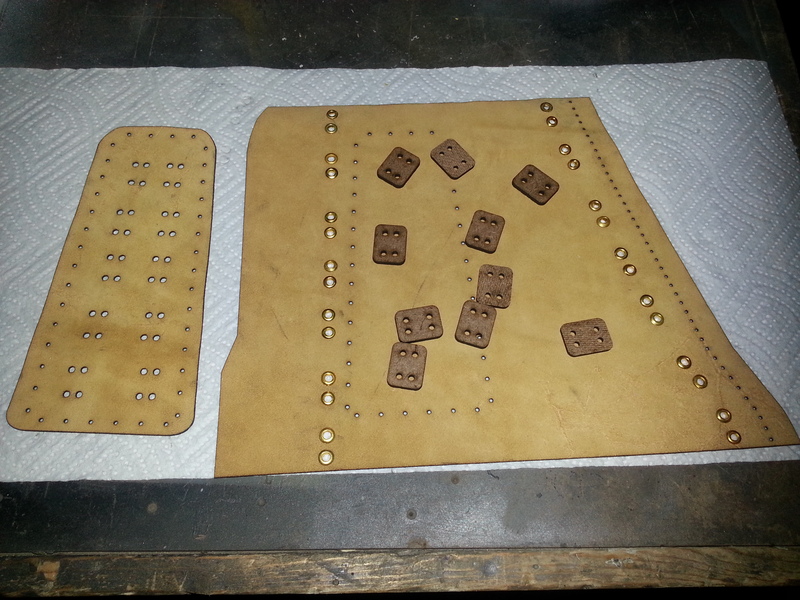 Immediately after the cut, the grommets were installed, and the armor bits were tied onto the doubler piece. The rolled edge was whip-stitched by hand and a braided leather cord was used as the lace for the doubler. Project complete! **** IMPORTANT! 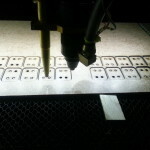 When planning to work suede on a laser cutter, remember that the cut edge will be covered in soot from the burn of the laser and cut pieces should be handled as minimally as possible to keep soot from being tracked onto the worked piece. The best remedy for preparing pieces for handling is to cover the entire face of the piece in a layer of corn starch and use a toothbrush to smoothly and evenly brush the starch off of the suede face. The corn starch will carry the soot with it, leaving the edges of the pieces clean. Robot Knife Fight is ready for some player testers. Ted and I will be at the shop this Friday (2013-06-28) starting at 8pm to help people get up to speed in how to compete and run a game. Bring your laptop with the Arduino IDE already installed. If you want to help improve the arena’s python code, clone the git repo. If scheduling permits we will be doing this every Friday until Detroit Maker Faire 2013.